A simple swipe to the right on a smartphone is connecting Chinese millennials with high-quality fashion brands from around the world, thanks to a young Australian entrepreneur and Chinese e-commerce giant Tencent. 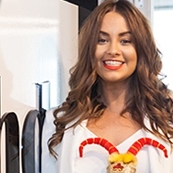 Jessica Wilson, a 24-year-old who grew up on a farm 500 kilometres north of Sydney near the New South Wales holiday town of Coffs Harbour, was inspired to develop a mobile phone application called Stashd while working at fashion industry events in Sydney, New York and Paris. Wilson spotted a gap between how millennials – the digital-savvy generation born between 1980 and 2000 – wanted to purchase clothing and what was on offer online from leading retail stores, labels and designers. She based her concept on Tinder, a popular dating app where users swipe right on their smartphone to register interest in a potential romantic match. The difference? She replaced people with clothes. Stashd acts like a digital mall and puts different retailers and designers into the palms of users. Rather than individual apps for each store or brand, the app allows users to shop in multiple online stores, have one user experience and, importantly, one checkout. The app takes a commission of approximately 8 percent whenever it sells a product. Launching in 2014, Stashd took hold in Australia, the UK and US after Wilson partnered with top retailers and designers in those regions. User numbers quickly grew to more than 100,000 in over 130 countries. Those numbers were promising and demonstrated the app’s potential. Then an appearance on Chinese television changed everything. In late 2015, The Next Unicorn, a reality TV program broadcast across China on the country’s largest business channel CBN, made a casting call for a startup at Wilson’s shared office space in Sydney. Wilson put up her hand. Stashd was selected to compete in The Next Unicorn’s 2016 season with 55 other startups from around the world. The TV show aims to find the next ‘unicorn’ – a startup that will grow into a $1 billion-plus business. Wilson pitched her business to a panel of judges that included the former CEO of online marketplace Alibaba as well as investors in Chinese search engine Baidu. Contestants had to demonstrate why their idea could succeed in China. Stashd impressed the judges and was awarded third prize. Not content with a trophy, Wilson was keen to capitalise on an open door to China and its potentially huge market. She trawled her professional network to find an introduction to TenCent – one of three e-commerce giants in the Chinese market. TenCent saw value in Stashd and partnered with Wilson to create a Chinese version of the app – a venture that will eventually see Stashd renamed for the China market. A key part of localising Stashd for China is rethinking its online presence and e-commerce: social media and internet platforms like Facebook and Google do not exist or are firewalled in China. Online payments with credit cards are also not standard practice. The Chinese version of Stashd will use platforms like TenCent-owned messaging app WeChat and payment service WeChat Pay to service the market. Wilson has never been afraid of a challenge, especially when told something is too difficult. She started her first business at the age of 16, hosting after-party events for classmates on her family’s farmland when her school banned extracurricular social activities. She then expanded the business to host parties for students from other schools. Wilson was studying business and events management at university but dropped out after a career counsellor told her she did not know enough people in the fashion industry to be a success. Wilson switched her focus toward real-life experience in fashion industry public relations and marketing, eventually landing roles with companies that produced events in Sydney, New York and Paris. To get an interview, she says she sent company bosses helium balloons attached to Champagne bottles. Wilson’s idea for Stashd struck while working on events where designers show their collections: “I was working on seating plans and could see this entire shift in the industry. Online was moving forward and brick-and-mortar stores and print media were going backward." Wilson travelled to Silicon Valley to attend networking events as an informal crash course in the tech industry and then returned to Sydney ready to develop and launch Stashd. Now, her idea to turn the fashion industry upside down – at least in China – is reality. Find out more about Stashd.